Happiness? Creepiness? A metaphor for some other larger theme? A morality tale without a moral center? Art for art's sake? A masturbatory exercise in surreal story telling? Some dark start to a retelling of the monomyth? We could talk large about this tale. I don't know. It's complicated, and perhaps your take on this goes back to our divergence on the documentaryHappy that we discussed a couple of weeks ago. You lean towards happiness easier than I, and I envy that in you, Sacks. Then again, maybe it has to do with Van Sciver's art -- so thick, dark, crosshatched, and ominous. Nobody smiles ever in this tale and they all hold their head slightly askew (shall we refer to this as "the Van Sciver tilt" from here on out). And of course there is the profusion of ink which, due to this presentation, absorbs deep in each newsprint page. This is a dark tale told darkly, inky, thick. And yet you still find happiness? Impressive, Sacks. I'm wondering if you found joy in Nic Breutzman's "The Mayfly" as well?? Jason: Wow, I like that turn of phrase, Elkin. The Van Sciver tilt. Nicely done, sir. And yes, for the second time in less than a month, you accuse me of being on optimist. I'm not sure if I should take that as an insult or compliment, and we can return to that topic if you choose as this review moves ahead. But you asked me about Nic Breutzman's The Mayfly, which is a story that has caused me tremendous consternation since I read it. I'm having trouble wrapping my mind around it, so maybe you can help me figure out if I actually liked that piece -- and (possibly) worse, if I found The Mayfly to also be optimistic. Actually, now that I think about it, I'd have to be completely starry-eyed to believe that The Mayfly is an optimistic tale. The two words that first come to mind when I consider Breutzman's story are bleak and surreal. Breutzman beautifully illustrates a tale about a bunch of people who legitimately could be called losers. Every character is fucked up in some way -- either they're on drugs, or they're emotionally devastated, or they're some sort of bizarre mutant, or they're an oddball combination of all three. Like the characters in Van Sciver's story -- it's intriguing how many overlaps there are between Van Sciver's and Breutzman's pieces -- there's not a lot of redemption or transcendence in the lives of most characters inThe Mayfly. They're sad husks just struggling to get by, often with the help of their latest mind-expanding substance. It's a wonderfully rendered examination of people that I might never hope to meet in real life. The surreal touches happen somewhat on the story's edges and with oddball character designs. We receive real jolt when Tim and Tom emerge from their house with bizarrely misshapen heads that contain eyes that hang down. I'm not sure if I can adequately explain how these guys look, but take a glance at the picture next to this paragraph to see that Breutzman has created incredibly memorable appearances for the beings that inhabit his tale. Unlike Van Sciver's Robin, Breutzman's Samantha has no chance of redemption. Though she passes several waypoints of Joseph Campbell's monomyth, Sam is as much as victim as the rest of her family. Samantha is trapped in dysfunctional family dynamics, dysfunctional drug addiction and a generally dysfunctional life. Like Van Sciver, Breutzman brings in some fairy tale elements to his narrative as well, specifically the scene with the Crack Witch, which reads like some strange otherworldly Hansel and Gretel legend where the kids are given dangerous drugs rather than sugary candy. That was easily the spookiest scene in this whole tabloid, which is a surprising thing to say about a comic that features a floating cow's head. I've never read Breutzman's work before, so I have no idea if these characters are part of a continuing series or if this is their one and only appearance. I'd have to say that I'm curious to read more about these people, which is certainly a sign of success. Elkin, what did you make of The Mayfly? What did you think of the central image at the story's end: a bug that's alive but trapped forever inside a Mason jar. Is that symbolic? Does that idea resonate with you? Daniel: Well Sacks, let me put on my English teacher pants and pontificate for a moment. The mayfly has traditionally been used in literature as a metaphor for the transitory nature of existence, as it only lives, typically, for a day or so, and its sole purpose in its adult form is to procreate. The note that Samantha finds in the box along with the mayfly reads "Ephemeros," a Greek word meaning "for the day" (thank you internet). How this symbolic sentiment fits in with the rest of Breutzman's story, though, is a bit obtuse. As you said, Sacks, this is a story filled with unredemptive characters, all slogging through an existence from which they are trying to escape through various psychoactive mechanisms. While Samantha does, at least, show a level of caring and empathy greater than the others, she mainly fills the role of enabler. What is it exactly that she learns from this experience, and how does this knowledge move her character along? Perhaps we have to look at Deep in the Woods as a whole to unpack what these two creators are trying to do. We've both referenced the Hero's Journey narrative pattern as we've talked about this comic, and I think we should pursue this idea a little further to understand exactly what is going on here as it may provide insight into why we both, though initially confused, have responded so positively to this piece. The title itself brings to mind the transition a hero goes through on his or her journey. They must chose to leave their ordinary world and venture forth on an adventure fraught with challenges in order to emerge a changed person, one who brings a boon of some sort back to the world they have left in order to right some wrong, or transition themselves into the world of adulthood. Both of these stories follow this pattern; our protagonists journey Deep in the Woods. Yet both Van Sciver and Breutzman seemingly end their stories before either of their heroes Take the Road Back to do something with what the experience has provided for them. Robin drags the gold back through the woods alone, Samantha holds the jar with the Mayfly trying to understand its significance. What are the next steps for each of these women? Where do these experiences lead them? They have gone deep in the woods, now where do they go? Here's another one (or two) for you: Does Breutzman's take on the Mark Twain story that runs beneath The Mayfly provide us with some clues? I'm not exactly sure, and, if it does, what exactly is it pointing to? Jason: The Mark Twain tale is also about a journey, isn't it, Elkin? The ghost travels Out of the Woods to reunite with his new widow, only to receive the most depressing and unhappy reaction that could possibly be delivered. Though Twain's piece has elements of the Hero's Journey, what is the boon that he brings back to his widow? As with the other two short stories in this collection, this story ends without giving readers a firm conclusion. We're left to ponder what happens next to that character as we are with Robin and Samantha. Robin and Samantha are both beset on all sides by their terrible existences. Things are dreadful for both girls. As their journeys begin, the girls truly can't even imagine their lives improving at all. Both have been treated like so much manure by the people who are closest to them. We observe something similar with the unnamed protagonist of the Twain piece. He's being chased by a pack of men who are ready to kill him -- for reasons that are unexplained and categorically don't need to be explained in order for Twain's narrative to work effectively. How can a narrative begin in a more desolate way than Twain's tale? There seems to be a clear parallel between the unnamed Twain piece and the narratives that Van Sciver and Breutzman deliver. All three stories show characters who are under attack, beaten, bruised, damaged and struggling to find some kind of positive element in their lives. Significantly, though, the ghost in the Twain/Breutzman story actually is able to interact with his widow Martha. He has the ability to redeem himself in some ways. But his interaction with Martha just causes both characters more anguish -- her muttered offscreen "please god no…" in the penultimate panel is a poignant way of showing her immense emotional anguish. If the three stories in this fascinating comic are connected thematically, that does indeed give us clues to the respective futures of Robin and Samantha and blows a giant hole in my optimistic take on Robin's future. Will her gold only bring her more frustration? If Samantha becomes a mayfly and experiences real change on that fateful day, can she possibly return a boon to the horrible people who share her existence or will she be forced to continue living in the same horribly dysfunctional way that she has been? I assume that you see much more "please god no…" than I do, Elkin? Daniel: I don't know, Sacks. Maybe it's because I've been drinking gin in the sun, but part of me wants to believe that a continuation of bleakness cannot ultimately be the moral of Deep in the Woods. We are at the halfway point in each of these tales -- the realization that things must change. 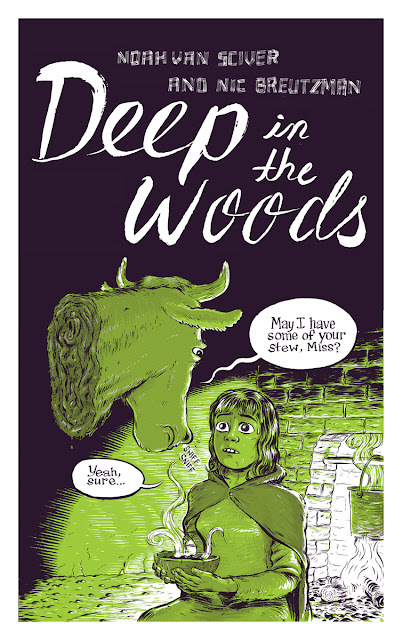 The boon has been granted by the mentor after they have gone through an ordeal -- the floating cow's head grants gold, the dying grandfather bequeaths a Mayfly in a jar, Martha has told her husband he is a ghost -- and now the characters must move on, continue their journey, get out of the woods. Perhaps your earlier optimism was the right attitude, Sacks. The monomyth requires there to be tests and obstacles before they can take the road back. We're only half-way, just deep in the woods. We shouldn't make judgments as to the final fate of our characters. The question needs to be, are these characters wise enough to make sense of their new knowledge? Are they strong enough now to not squander their boons? Neither Van Sciver nor Breutzman have a particular history of telling the uplifting story. Does Van Sciver's 1999 or Breutzman's contributions to Motherlover indicate they believe redemption is at the end of a hero's journey? I don't think so. But perhaps with Deep in the Woods they have both purposefully ended their stories in the middle to let the reader decide what happens to their characters in the end. You're an optimist, Sacks, so why can't you believe that these women in these stories end up triumphant, heroes who bring about a positive change to their respective worlds? And you know what, I'll take another gin swig in the sun here and by golly, I'll agree with you. You can advance order Deep in the Woods from 2D Cloud's website.